Last week was Halloween, one of my children’s favorite holidays. My older daughter was a reporter (a costume so subtle that you could only tell she was dressed up because she was holding a small notebook and a pen), my son wore four different costumes (Storm Trooper, Ninja, Iron Man, and a Vampire) in three days to different Halloween themed parties, and the youngest decided to be Elsa, for the second year in a row! 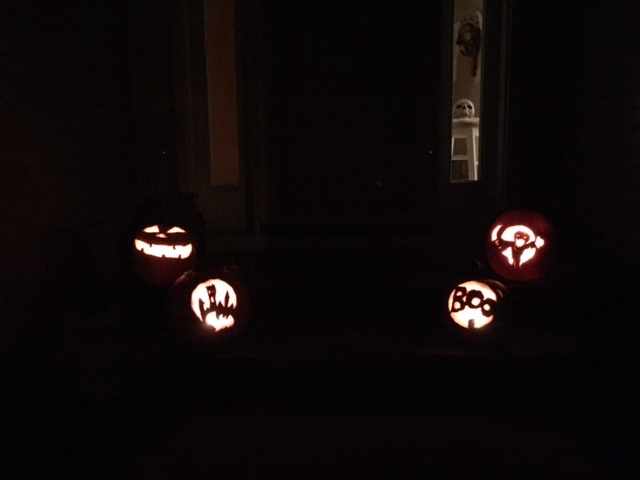 Our carved pumpkins this year. 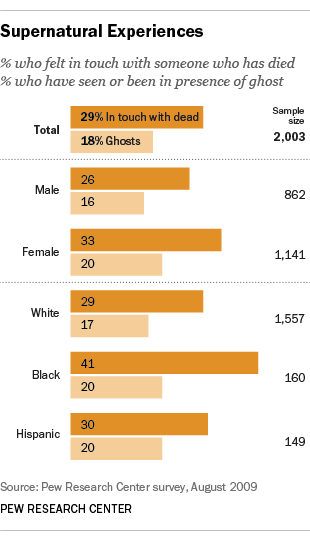 What makes the Pew research survey remarkable is that it shows how Americans hold beliefs regarding ghosts and spirits that do not have a place in our accepted scientific worldview, and that do not easily fit into traditional religious worldviews. The question then is how do we understand those beliefs? How do we explain them? How do we find acceptance of them in our daily lives? One of the powerful effects of Halloween, as it is practiced in America, is that it allows American culture to solve the tension expressed in the Pew research center survey just cited, by allowing people of different religious backgrounds and beliefs (Christians, Jewish, Buddhists, Atheists, Agnostics) to ritually and communally celebrate a diverse and at the same time vague understanding of the supernatural, without relying on any particular explanation about its metaphysical nature. To use a common tension explored in the field of religious studies, what matters is the orthopraxy of the holiday (correct practice) and not its orthodoxy (correct belief). In other words, practice becomes the central aspect of the ritual/festival, without any need on the part of the participants to have the same beliefs about what they are celebrating. By enforcing orthopraxy (correct practice) rather than orthodoxy (correct belief) state officials made it possible to incorporate people from many different ethnic or regional backgrounds, with varying beliefs and attitudes, into an overarching social system we now call China […] I am not suggesting that belief and ideology are somehow irrelevant to the process of cultural integration in China […] Rather, I would argue that the Chinese state had no effective means of controlling beliefs regarding the afterlife in the absence of a unified church. While the case of China is quite different (historically and culturally) from that of the United States, I think it is interesting to note that a holiday so generally accepted and celebrated as Halloween, regardless of an individual’s particular religious affiliation or belief regarding spirits, or any particular notions of the after life, culturally unifies a country (a state) by reinforcing practice over belief. We dress up in scary costumes, we carve scary looking pumpkins, and we watch horror movies (we took our kids to watch the new Goosebumps), without having to discuss or acknowledge our views on the matter. If Halloween allows us to celebrate a widely held, but vaguely defined notion of ghosts and spirits, now the question is how do we explore and express those beliefs that do not have a place in contemporary religion or modern science? What are ghosts? And spirits? How is their existence explained? What do they want? Where do they live/exist? My short answer: horror movies. An important component of modern Halloween celebrations is the release of horror movies by major studios. This year we had Guillermo del Toro’s Crimson Peak, Night Shyamalan’s The Visit, Vin Diesel’s The Last Witch Hunter, Goosebumps, Paranormal Activity: The Ghost Dimension, Scouts Guide to the Zombie Apocalypse, The Green Inferno, and although it was released in late September, I would also include the animated Hotel Transylvania 2. If we extend our range of popular explorations of the afterlife to current TV shows, and we look at the genre beyond its Halloween period, we will find an incredible number of shows that deal with ghost, spirits. Among the most popular ones are American Horror Story, The Walking Dead, its spin-off Fear the Walking Dead, the new STARZ’s Ash vs. Evil Dead, Supernatural, Scream Queens, The Strain, The Vampire Diaries, Hemlock Grove, iZombie, The Originals, Grimm, Penny Dreadful, Haven, The Returned, Sleepy Hollow, From Dusk Till Dawn, Z Nation, and on and on and on…. What I would like to argue here is that, while there is not a cohesive or consistent view of the afterlife in these movies and TV shows, they all share a modern concern with the supernatural, a concern that it is not always reflected in traditional religious traditions, or accepted by our modern scientific worldview, but that it is still there, in the background, in our unconscious, and with an urgent need to be expressed. These movies and TV shows operate as a form of popular theology on the subject, offering sometimes quite detailed cosmologies in which the existence of ghosts and spirits is not only acknowledged but also explained. These movies and TV shows do not only offer thrills and scares, they also offer explanations for what a sizable percentage of the population believe, as seen in the Pew and Gallup surveys, without having a coherent or cohesive idea of what those beliefs are. I have already talked in this blog about the HBO show The Leftovers, a modern take on religion and spirituality that includes very interesting explorations of the supernatural: shamanic possession, healing powers, appearances of ghosts, and other unexplained phenomena. A more popular take can be found in the CW’s Supernatural, in which the Winchester brothers hunt demons, ghosts, monsters, and other supernatural beings. The fact that the show is in its 11th season speaks, it seems to me, to the need in popular culture for shows in which supernatural phenomena are explored, even if it is in a superficial manner. Those movies and TV shows operate, in fact, as a modern and popular form of scripture. In his 1993 book What is Scripture? the scholar of religion, Wilfred Cantwell Smith, warned us of the dangers of narrowly defining the term “scripture” as simply referring to the holy texts of a particular religious tradition. While, as Smith argues, it is true that scripture has been interpreted in many religious traditions as texts inspired by a divine source that allows member of a particular faith to connect with what Smith defines as “the transcendent,” he also added a second characteristic of scripture, mainly, the fluid and intimate relationship that a particular community develops with a particular text. The introduction of this second characteristic of sacred texts allows Smith to shift our understanding of scripture from the text, which is no longer simply an object, to the relationship between the object and its interpreters. What matters is not only what the text says, but how its ongoing relationship, through time and space, evolves and changes with a community of believers. In his own words, “Their being scripture, once they had become so, has given them in the life of society and in personal piety a role rich, complex, and powerful” (Smith, p. 4). The China’s Film Bureau bans a movie like Crimson Peak because it asserts that ghosts are real. They take the movie not simply as fiction, but as the reflection of popular beliefs in the supernatural, beliefs that contradict the official, modern scientific worldview of the communist party.